I haven’t completely abandoned my blog… yet. In the coming weeks, I plan to update my blog with more technical posts. I’ve been busy over the past year, and have hacked a couple of devices, while improving and upgrading various PC’s. Yesterday, Microsoft released a 90-day trial version of Windows 7 Enterprise for IT professionals. It might be a worthwhile download if you are curious if your existing applications will run on the new operating system. The basic hardware requirements are a 1 GHz or faster CPU, 1 GB of RAM and 16 GB of disk space. As noted on the Microsoft TechNet web site, Windows 7 Enterprise will not be available through retail channels. Today, I managed to install iPhone OS 3.0 on my iPhone 3G after a little trouble. I noticed a new Voice Memos icon on the iPhone. Right then, I knew it was running 3.0 instead of 2.2.1. I was a little puzzled. Even though I double-clicked on the 2.2.1 restore file, iTunes decided to use the 3.0 software (in the same folder) for the restore. Hey, I’m not complaining. It worked perfectly, and all my contacts and applications are available for use. 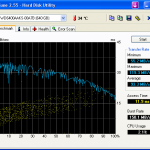 I have been running a Western Digital Raptor 74 (WD740ADFD-00NLR5) on my development PC for a couple of years. Before that, I had an older Raptor, the 740GD-00FLA with 8 MB cache. I never had a problem with either of them, except for the noise. The loud reads and writes by the drives had annoyed me in the past, and one day I decided it was time for a change. I had run a Seagate Cheetah before (and a Quantum Atlas before that), but I didn’t like having thick cables and extra expansion boards in my computer case. I had also run two 74 GB Raptor’s in RAID 0 (backed up to a NAS device, of course). Cables. Cable terminators. Expansion boards. More heat issues to worry about. In the end, it came down to reliability and speed, and I needed both… (and before you state SSD’s, I think I’ll pass until I see some long-term numbers). The first thing I noticed about the VelociRaptor was that it was QUIET. Really quiet. As quiet as my WD Blue and Black Caviar’s. It runs cooler and appears to draw less power as well (and no, you can’t run it in a notebook). How does it perform? I decided to find out. I used the same test configuration as my previous WD Blue/Black test to maintain some consistency. Today, Microsoft released Windows 7 Release Candidate (RC) 1 (Build 7100) to the public. This Release Candidate debuts Windows XP emulation mode, which something I’ve been looking forward to. Users can now install legacy Windows XP applications inside a Windows XP virtual machine. I, for one, don’t foresee myself upgrading from Windows XP unless my current business applications work correctly with Windows 7. Likewise, plenty of businesses I’ve talked to plan on using Windows XP until it’s no longer supported (sometime in 2014). New features in this build include faster installation, more themes, new drivers and an updated build of Internet Explorer 8. Microsoft claims the release date should be sometime in January 2010. However, many PC manufacturers will be installing it on new PC’s before the holiday rush. The official release date is supposedly October 22, 2009. 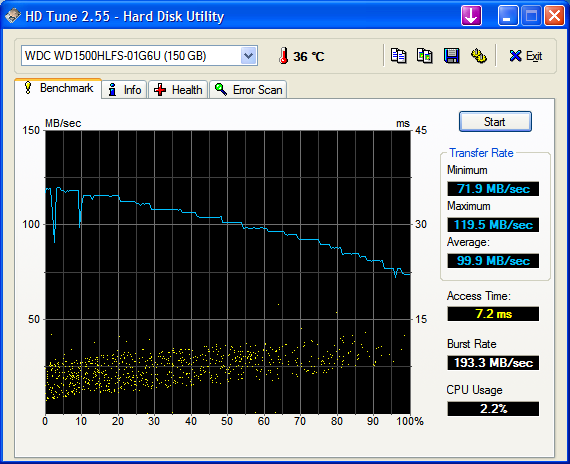 I’ve been running the Western Digital 640 GB AAKS (SE16 series) drive in my main system for quite some time now. I was happy with it until I noticed Western Digital had begun showcasing their new Caviar Black series hard drives as the ‘fastest 3.5-inch 7200 RPM drive on the market’. The Caviar Black series sport dual processors, 32 MB cache and a five year warranty (vs 16 MB and three years for the Caviar Blue). Does the WD Caviar Black really live up to the hype? I hate to say this, but no. It actually performed slower than my older WD 640 GB AAKS with a single processor and 16 MB cache! Don’t believe me? Take a look below! Test configuration: Intel Core 2 Duo E8400 @ 3 GHz, 4 GB Corsair XMS2 DDR2-800, Gigabyte P35-DS3L (F8b), Seasonic S12 600W power supply and of course, APC RS 1200VA regulated power. Operating system: Windows XP Professional w/ SP3. Both drives were imaged using Ghost 2003 and defragmented using PerfectDisk 2008 Professional. Software: HD Tune 2.55. Hard drive 1: WDC WD6400AAKS-00A7B and hard drive 2: WDC WD6401AALS-00L3B. AAM was confirmed as disabled on both drives using Hitachi’s Drive Fitness Test. As you can see, the Caviar Black 640 GB doesn’t perform all that better than the Caviar Blue (SE16) 640 GB.